Recent research indicates that previously unnoticed declines in box turtle populations have become apparent across the country. What were often regarded as ‘good numbers’ in box turtle density, have been determined to be insufficient for healthy population growth and survival. Although Indiana does have a few healthy populations, these populations are widely scattered. Timber harvesting is a major land use activity throughout the range of this forest species that could impact turtle populations. Our research is designed to evaluate the responses of box turtle home range and habitat use to even- and uneven-aged timber harvesting. 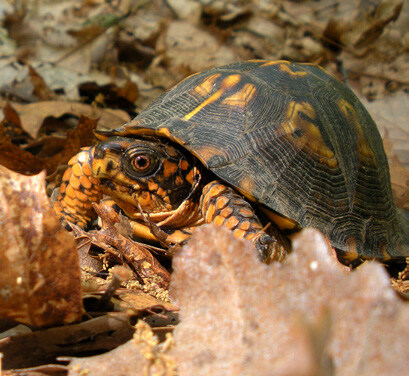 Beginning in May 2007, we located box turtles in 6 research core areas (2 control, 2 uneven-age, 2 even-age) and subsequently tracked individuals 2-3 times per week through October 2007. Vegetation characteristics collected at a subset of turtle locations will be used to assess box turtle habitat use and selection. Relatively high population densities of box turtles are required for successful reproduction. In 2007, we established two, 20-acre search plots within the each core area. Plots were searched for turtles 6 times to estimate local population densities within each plot. All data collected in 2007 and part of 2008 will serve as the baseline to compare to post-harvest responses. Timber rattlesnakes have experienced population declines throughout most of their range. These population declines have been attributed to habitat loss, habitat fragmentation, and human persecution. Within Indiana, timber rattlesnakes have been listed as endangered due to extensive population declines. Although previous work has been performed on the spatial ecology of this species within Brown County, no information exists on the effects of timber harvesting. This study will attempt to quantify the effects of timber management practices on rattlesnake movement patterns and habitat selection. 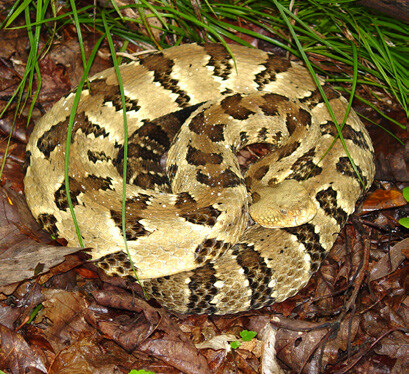 Beginning in May of 2007, surveys for timber rattlesnakes were preformed within core units where previous observations occurred. Nineteen snakes were observed as part of these surveys. A subset of captured rattlesnakes (6M:5F) were implanted with a radio transmitter and tracked 3 times a week throughout their active season. Radioed snakes are currently located on control and even-aged management units. All snakes were tracked to their respective hibernacula. The habitat selected by study individuals was quantified and will be compared to paired random habitat measurements. Data collected from 2007 will be used for comparison against post harvest snake radiolocations and habitat selection.